Editor’s note: Paul Brailer, aka Criptaedo, was born with spina bifida. He uses both a wheelchair and braces with crutches. After being told “he couldn’t” throughout his youth, he decided he could. After high school, I wanted to be a masseuse. Being in the hospital and in physical therapy my whole life, I was kind of self-taught. I took the entrance exam to get into the Ohio College of Massotherapy, and I got the highest score in the history of the college. So, I went to an agency called the Bureau of Vocational Rehabilitation to try to get funding to pay for school. I went through all of their testing and rigmarole, and they told me that they wouldn’t pay for me to go to school because I had what they called an organic mental disorder and that I was incapable of learning. Editor’s Note: The Bureau of Vocational Rehabilitation is an agency run by the state of Ohio providing programs and services to individuals with disabilities to help them secure employment. After that, I went into a six-month depression, and I lost my high school sweetheart. I talked to an attorney about the situation with the BVR, and she told me that the phrase “organic mental disorder” is often used as a legal loophole because it can’t be proven or disproven. That was 27 years ago. It just so happened that one day at a local hamburger station, I came across a lady wearing a t-shirt that said, “The Art of Karate”. I said to her, “I like Bruce Lee,” and we started talking. She told me to come up to the karate school and watch a class. 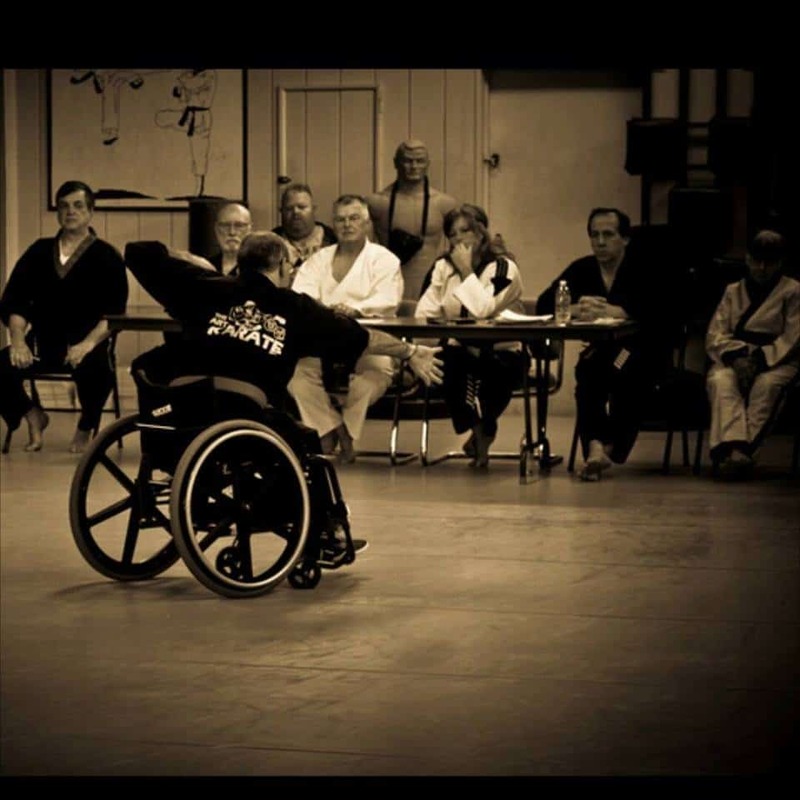 Here’s this lady telling this old guy in a wheelchair to come to a karate school. That was a self-esteem boost in and of itself because I was told as a kid that I’m just going to exist. So I signed up for a class and went. 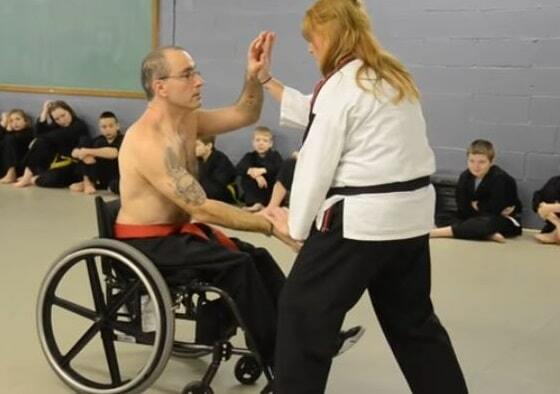 We did pushups, punches and rolled around on the floor, and three and a half years later, I became the first person with a disability to achieve a black belt. Before getting my black belt, I actually tried to quit a few times. The first time was right at the beginning. I was in class, and the instructor was telling us, “Your power comes from your hips. If you’re going to break a board, you have to use your hips.” I’m thinking, “I’m in a wheelchair. 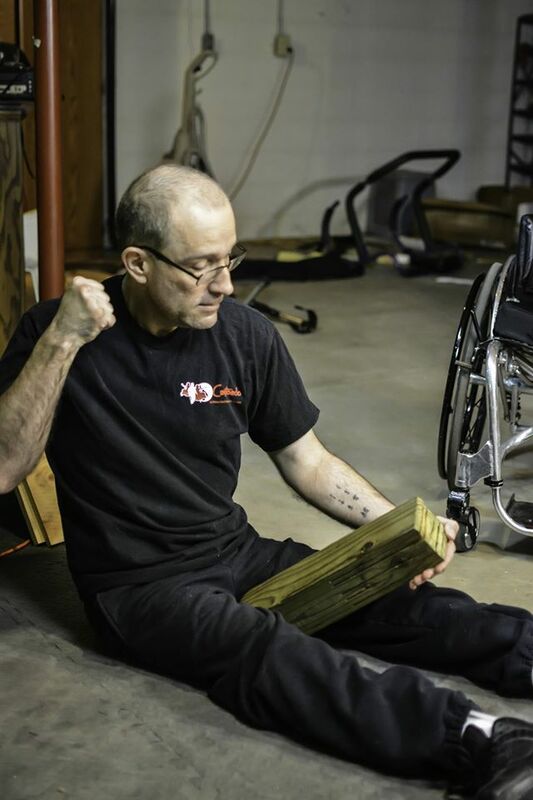 I have spina bifida.” I knew there was no way I would be able to break a board using my hips, so I was done. I quit. But, one of the black belts there, Tony, said, “Paul, we’ll figure something out.” So I had to figure out how to break a board using just my upper body, and I did. I tried to quit another time was when I was working on my brown belt. Each rank has what we call forms. I have to modify them because sometimes they have a kick in them. So, instead of a front kick, I’d do a palm heel strike, or instead of a sidekick, I’d do a punch out to the side, and for a roundhouse kick, I’d do an elbow strike. So, this form, Chulge Chodan, is done on a line going side to side in 18 seconds or less. 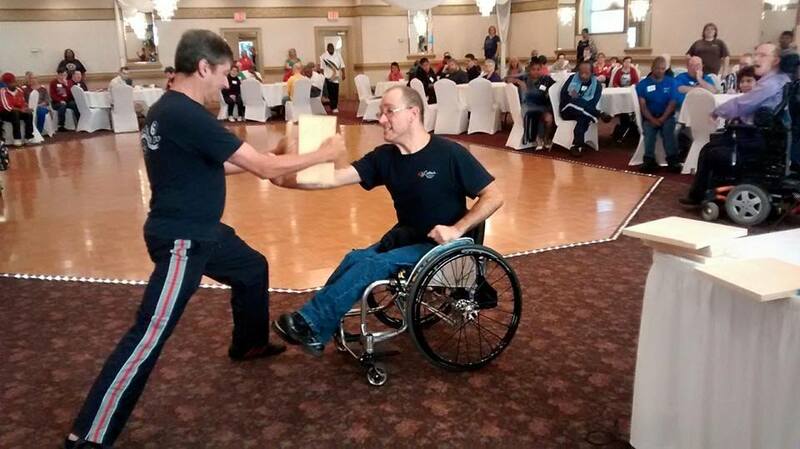 My grandmaster said, “Paul, you’ve done every form so far sitting in your wheelchair. 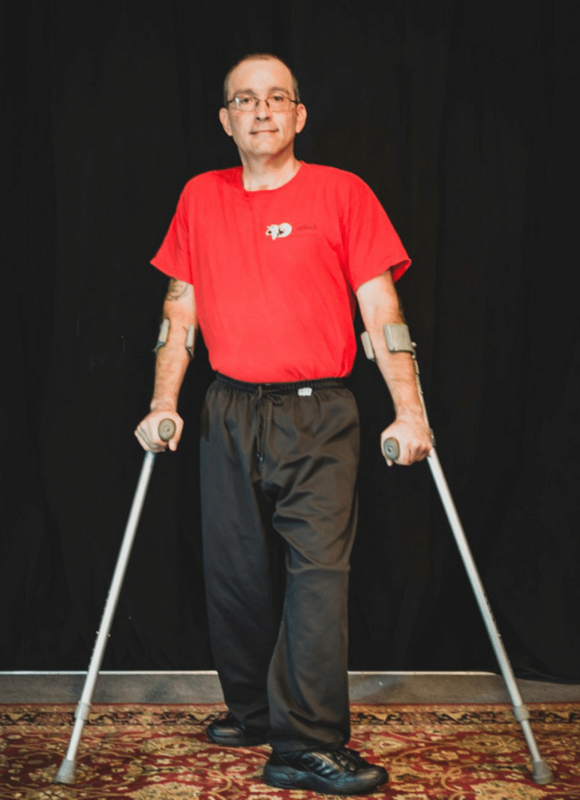 You’re doing this one on your crutches.” There are crescent kicks and elbow strikes, so I had to be on my crutches moving side to side, modifying the kicks and elbow strikes without falling. I had to let go of my crutches to do the elbow strikes. My grandmaster said, “Get on the line,” and I left class and quit again. Then Tony called me and said, “Paul, we’ll figure it out.” And again, three months later, we figured out how to modify it, and I got my brown belt. I was 40 years old, and that was the first time in my life anybody had ever called me normal. When I opened the door to go to class, the lady who is now my grandmaster, Miss Rudibaugh, told me that God had not given me the ability to fly. For whatever reason, probably because I viewed her as the best martial artist I know, I thought, “Ok, God didn’t give me the use of my legs, but he gave me a mouth and an upper body.” That’s when I started Criptaedo. The art of karate is called taekwondo, which means “the way of the hand and foot” in Korean. I took the foot part off (kwon) and replaced it with “Crip,” as in crippled, and got Criptaedo. If you can’t make fun of yourself, you’re going to be miserable! I used to work at a local mall that’s now closed. The week that my former store closed, I went up there to see my friends. When I was leaving the store, I was pushing myself down to the bus stop in my wheelchair. I was a blue belt at the time, and one of Akron’s youth decided he wanted my fanny pack. So I put him into an arm bar and popped his elbow for him. He screamed and went the other direction, and I went and got on the bus. I like to say he got beat up by the Crips. The average untrained abled-bodied person can run for a short distance at 15 mph. If a non-disabled person attacks me, I can push my chair at 8 mph. He or she can run at 15 mph. I lose. So, if you are a disabled person in a self-defense situation, you have to disable the other person. That’s what I teach. You have to go for their eyes and their throat. It takes on average 2.5 lbs of pressure to pop an eye out. It takes about 8-9 lbs of pressure to break a collarbone. Your esophagus is the consistency of an empty pop can; it’s very easy to crush. Those are targets that I teach. If you can’t breathe, you can’t fight. We’ve all heard of the fight-or-flight response, right? Disabled people, depending on their disability, don’t have the luxury of the flight option. All we can do is fight. Editor’s note: For more data on violent crimes against disabled people, visit the Bureau of Justice Statistics website. The main goal with Criptaedo is to work on people’s self-esteem. I’ve done disability awareness photo shoots. I wrote a poem called “Don’t Forget To Be Perfect” and Faces of Spina Bifida Magazine published it. (Editor’s note: Paul’s poem can be found here.) It’s about me and how I perceived being told that I’m “less than”. I didn’t have a great education, so I perceived the able-bodied world as better than me. I got a letter from a lady stating that if it weren’t for Criptaedo and seeing my photos from the disability awareness shoot, she would have killed herself. I got another letter a couple weeks ago from an overweight woman. She’s been working out and has started getting her weight down after being inspired by watching my videos. Another woman wrote me about her son and how Criptaedo has encouraged him. If your heart is set on it, you can do it. That’s what I try to convey to people. It just boggles my mind that people are so impressed with the guy who can break boards. Anybody can break a board if you’re trained properly. Anybody that takes the time to do “x” can do “x”. 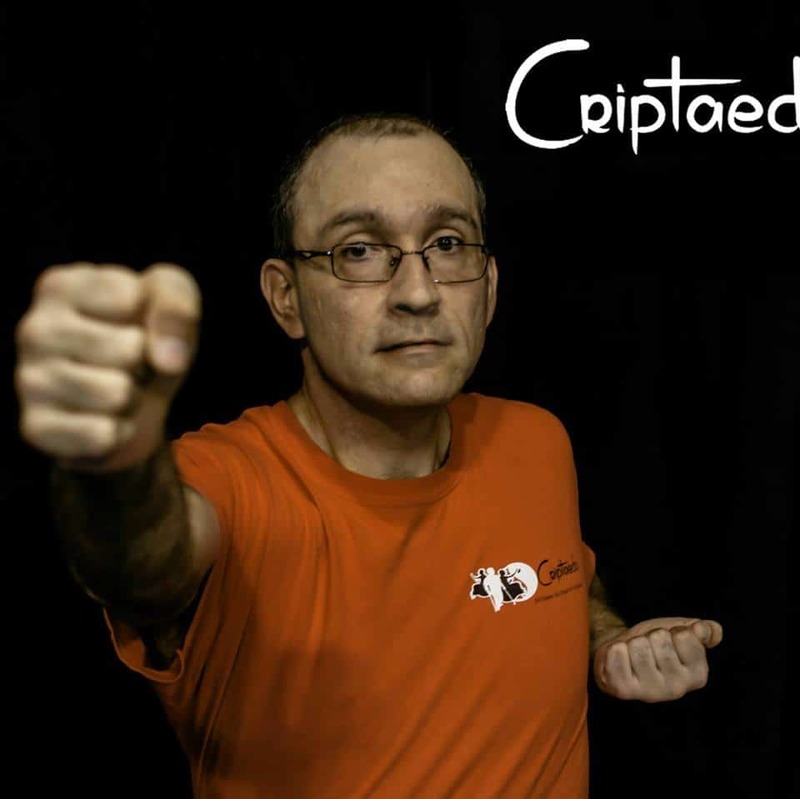 I do inspirational speaking and self-defense demonstrations. 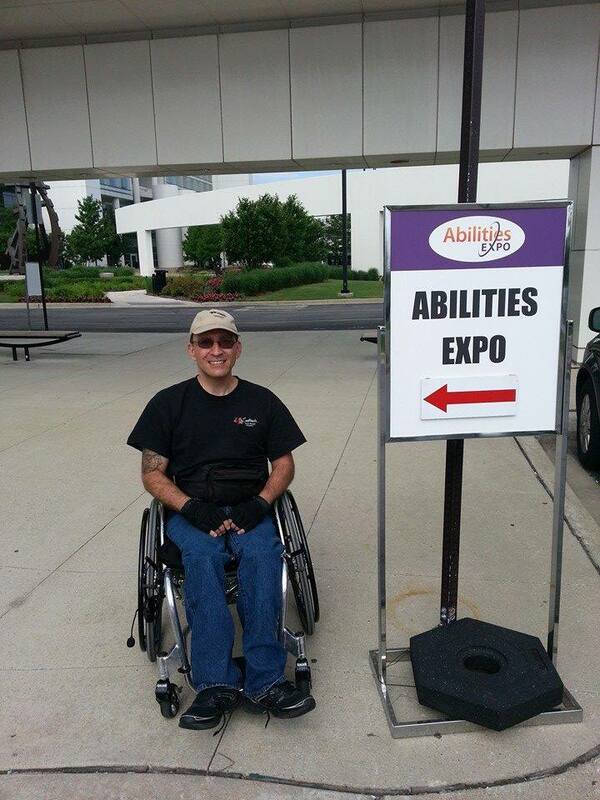 At the Abilities Expo, I do workshops and cater what I teach depending on my audience. I have developed different strategies depending on abilities. I have to get the message out to disabled people that they can defend themselves. My main goal is to help people gain self-esteem because disabled people in their thirties and older were told that they “couldn’t, shouldn’t and can’t”. 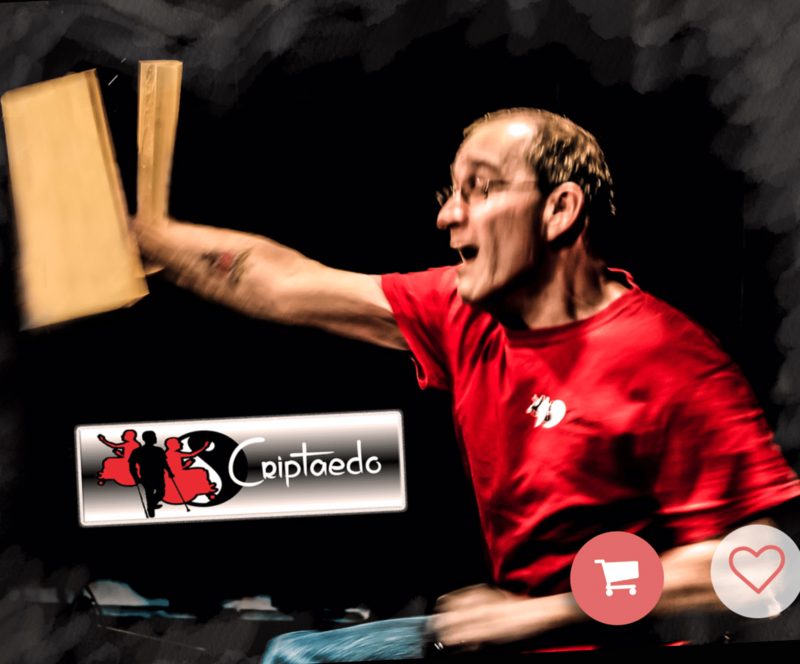 Editor’s Note: Follow Criptaedo on Twitter, Instagram, and Facebook, or reach Paul directly at Paul@criptaedo.com. 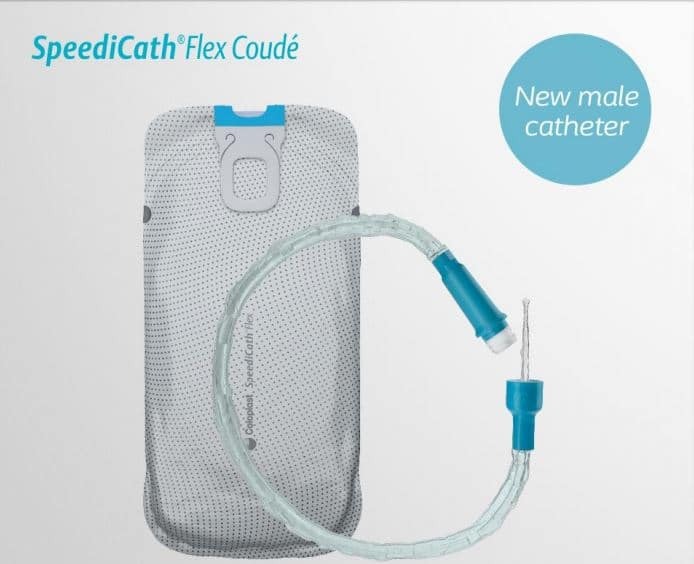 Introducing SpeediCath® Flex Coudé – every detail makes it easy! 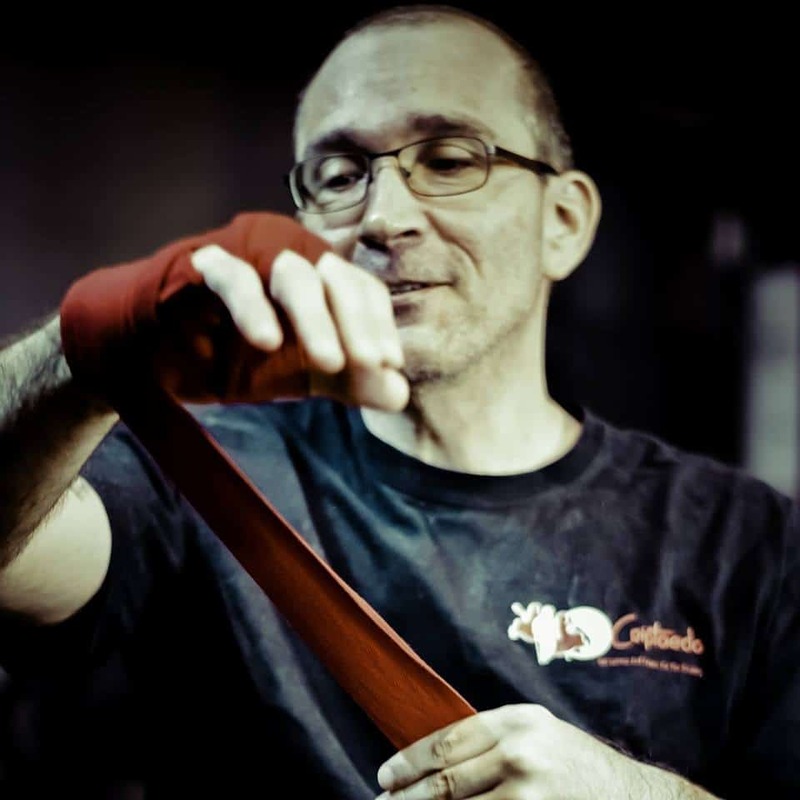 “I think Flex gives you total discretion.” Kevan, SpeediCath® Flex Coudé user. Kevan is a SpeediCath user who has received compensation from Coloplast to provide this information. We designed SpeediCath® Flex Coudé to give coudé users a safe and easy-to-use solution that fits into their everyday life. Visit our website to request your free sample and learn more about how Kevan found discretion with SpeediCath® Flex Coudé.